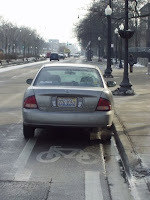 Chicago Bicycle Accident Lawyer | Illinois Bicycle Lawyers at Keating Law Offices: Report Bike Lane "Scofflaws"
One of my favorite episodes of Seinfeld is "The Scofflaw," where Newman was the "great white whale," a traffic ticket scofflaw who parked wherever he wanted. Any Chicago bicyclist would have to wonder if thousands of Newmans have invaded the city's streets with the sole purpose of parking in bike lanes. A clever site called MyBikeLane-Chicago allows bicyclists the opportunity to report scofflaws that treat bike lanes as extra parking or a personal loading zone. My neighborhood on the near West Side is featured as a "hot spot." 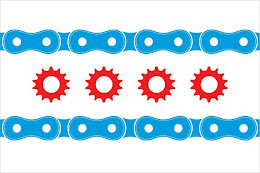 I've posted a link in the "Useful Bicycle Links" section to the right of this post for the website. The "Pedestrian Hell" website also includes a "Bike Lane Hall of Shame." With the convenience of a cell phone I'm going to start making regular additions to this website with all the scofflaws I see parking in bike lanes. Added Coun. J. 7-12-90, p. 18634; Amend Coun. J. 9-1-99, p. 10503, § 1; Amended Coun. J. 3-12-08, p. 22783. If you have any questions regarding this post, Illinois Bicycle Law, or have been injured in a bike accident, please contact Mike Keating at mkeating@keatinglegal.com.